So if you know any bit of Spanish, you know that some of the words on this sign aren’t spelled quite right. That’s the thing. It’s not Spanish. 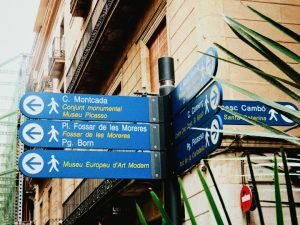 It’s Catalan, the language many people here in Barcelona speak on top of Spanish. And, when I say language, I mean LANGUAGE. Catalan is not a dialect of Spanish. Catalan is a full-fledged language; it is! Basically, Catalan is a blend of Spanish and French, which makes total sense knowing Spain and France border each other and Catalunya is the region of Spain bordering France. In Catalan, the letter “J” makes a J sound, whereas, in Spanish, it makes an H sound. In Catalan, the letter “N” with a tilde is not used as it is in Spanish. Instead, the letters “N” and “Y” are used. For example, Catalan people use the word Espanyol as opposed to Español. In Spanish, the use of the letter “L” twice in a row make a Y sound, but, in Catalan, double “L’s” just make an L sound. In Catalan, the letter “X” makes a CH or SH sound. In Barcelona, the word xocolata is used and makes the same sound as chocolata. The letter “X” is actually used pretty often in Barcelona! A lot of times, the letter “T” used at the end of certain words in Catalan isn’t pronounced. So, don’t pronounce the “T” in Sant! It does get tricky for certain words. Take the city that I’ve lived for this month: Sant Cugat. The “T” in Sant is not pronounced, but the “T” in Cugat is. No idea why. I’m sure Google has an answer. Finally, my new favorite word: “Vale.” “Vale” is a word used mainly just in Spain. It generally means okay but the Spaniards here use it very often like a filler word for meanings beyond just okay. It’s fun to say. ¡Vale! So, you get the point, there are a lot of differences between Spanish and Catalan. Even more impressive, many of the Spaniards I have interacted with here in Barcelona know English as well. Pretty impressive being trilingual, huh? I think so. Here, in Catalunya, the language Catalan has SO much to do with personal identity. So much, that it helped call for independence in recent years. Catalan people have a language separate from the rest of Spain, a strong futbol culture (¡Viva Barca! ), a poppin’ economy with a whole lot of $$$, and a history deeply-rooted in a distinct culture. There’s no wonder Barcelona is decorated in so many yellow ribbons, yellow Catalan flags, and signs calling for independencia. Imagine having lived in Catalunya all of your life, learned Catalan as your first language, or had Catalan nationalist ancestors. Imagine then trying to identify with other Spainiards beyond the Catalunya region. Ultimately, language is so much more than what comes out of your mouth. It is the fuel to fiery hearts, pride and nationalism, and the calls for independence. I really have come to learn that here in Barcelona.